DECEMBER 30--Okay, so every year TSG tries to come up with a nifty holiday gift to bestow upon our friends and colleagues. Two years ago, we produced a deck of celebrity mug shot playing cards. Last year it was a ready-for-your-fantasies Bill O'Reilly loofah. 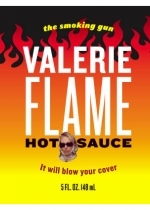 We think this year's gift is even hotter: it's 'Valerie Flame' hot sauce, the condiment that will 'blow your cover.' 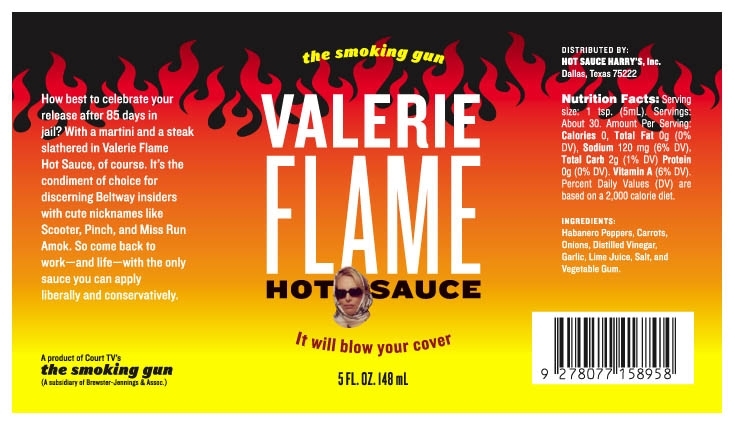 The hot sauce is a nod to one of our favorite 2005 stories, the Valerie Plame/CIA leak scandal. For those of you who don't get the reference, 'Valerie Flame' is the name New York Times reporter Judith Miller mistakenly wrote in her notebook when a source first slipped her Plame's name.